From the series Sundays at Sea by Angela Kelly. Angela Kelly is a photographer, lecturer and a well regarded writer on photography. Originally from Belfast she is currently based in New York where she is Associate Professor in Photography at Rochester Institute of Technology, Rochester, NY. This interview takes us through her experience of re-thinking documentary photography as well as speaking in depth about a few of her projects. Considering her position one might be forgiven to presume she would do this in a detached and academic manner, however she confronts us with disarming honesty in a personal and tragic family history. Angela has used photography to bring elements of the past into the present, to make the political personal and to help make sense of certain events. By entwining different ‘languages’ Angela’s research engages immediately with reality yet retains ambiguity and the fictional qualities of an artist. Sharon Boothroyd: Conceptual Documentary is a term currently used to describe a new kind of documentary. I was interested to find you define some of your work in the category The Conceptual Document. Could you describe what this term means to you? Angela Kelly: Let me begin by backing up a bit to give you a sense of the trajectory I’ve traveled as a photographer working towards this idea of the conceptual document. My earliest instinct as a fine art photographer in the 70’s was to question the validity of a documentary photograph as a simple transparent reflection of reality. In the series of street photography images made between 1972- 1992 for example, I made work that was conscious of the gap between what lies in front of the camera and its manifestation as an image on paper. In early work, I addressed the question as a female street photographer of how I might engage with that genre differently. Street photography then as a genre was male orientated and often voyeuristic. I embarked on a journey reveling in the pleasure of the formal image as both a printed surface made complicated by shadow, reflection, framing and depth of field, as well as engaging with the idea of what it means to interact in a public space as a female photographer. My desire was to push and pull the shift from the so-called ‘real’ towards the illusionary and back again, all the while maintaining a practice on the ‘edge’ of documentary language and fine art photography. Documentary photography as a practice for which I have tremendous respect was singularly frustrating to me since it presupposed a conceit of the photograph as an objective window onto the world. The question I asked myself was, can I create work that both recognizes the indexical power of photography while framing the subject within a visual language that contests those assumptions? I could default towards pure abstraction but instead chose to maintain one foot on the ground between the poetic and the documentary. My ambivalence towards objectivity in photography led me to seek out not only theories of representation, but to attempt to build upon my own knowledge based not only on an awareness of theory and conceptual art practices in general but on my actual visual practice. By the end of the 70’s, I had thrown myself into questioning documentary practice while desiring to reframe it and to bring it to another place. My first public attempt to do this was through a major curatorial project for the Hayward Gallery in London in 1979. As a member of the photography panel of the Arts council of Gt. Britain, I researched and developed a thesis for my contribution to the exhibition, Three Perspectives on Photography co-curated with Paul Hill and John Tagg. I was eager to bring into focus some of the pertinent work made by women photographers who were not only addressing the concrete lives of women as subject but also whose methodology offered up a more complex way to understand the nature of documentary language. As such, my curatorial selection for the exhibit included a conceptual book maker, a feminist-Marxist filmmaker, a working photojournalist, a feminist activist whose use of vernacular family photography brought both boos and hisses and great acclaim from the art press, and a portrait photographer who grew up in the East end of London observing her working class friends transform into heroic icons based on images drawn from popular women’s weepies of 50’s and 60’s. The language of postmodern deconstruction was not yet the vital part of British cultural discourse in photography departments in universities it was to become. Victor Burgin was instrumental in leading that change with his work in the late 70’s. There was a great deal of anxiety expressed both in response to the critique of the loss of documentary value of the image, and the newly emerging (mostly un-critical) fine art practice for which there was also a great deal of hostility. This shift away from the documentary towards fine art in British photography coincided with a new beginning in my art and teaching career. In 1980, I accepted a position at the School of the Art Institute in Chicago where the only rule was there are no rules. From the series Chrysalis by Angela Kelly. Experimentation drove both students and faculty work there alike but there was little or no interest in engaging in the subject of the critical document or the politics of representation at that time. My frustration concerning the document continued to surface. I taught a class inspired by Allan Sekula’s writings, which I titled, ‘Re-inventing Documentary.’ It was another step on the long journey towards articulating my vision as an artist of a new critical practice that was grounded in both a theoretical understanding of the power and limitation of the documentary image and incorporated strategies of collaboration with the subject with particular attention given to the concept of installation and display. I made a large body of work titled, Chrysalis which began as my Master’s thesis at Columbia College. This work was an attempt to engage in a critique of documentary within a fine art context. The resulting work led to a 75 print exhibition comprised of a series of intimate environmental portraits of a feminist community of young women at an alternative school or learning center in Chicago. I juxtaposed their poetry and my work to engage the audience in the discourse on the fragmentary nature of the document. This approach was exemplified through the construction of an installation, which placed less intimate small vernacular images of the school environment under the intimate portraits; these additional smaller images were to be read not so much as photographs in themselves but as visual texts serving to inform the larger portraits. The resulting questions about engaging with a community, incorporating their voices through collaboration as raised through the installation were important to me as a practitioner. Several other projects followed in a similar vein where I placed different kinds of work together in an installation context raising more questions than answers. A later example is the work, Aftermath, which represents my attempt to work again with the documentary mode after a long period of working only with digital collage and image-text. Like the former series of photographs made about homeless teens in Chicago for an exhibit, At the Edge of Shelter curated by David Travis, I wanted to see if it was possible to respond to a well- worn clichéd subject and create something other than a cliché. I traveled to New Orleans to be a Visiting Artists at the university of NOLA, to witness for myself how three years after Katrina; New Orleans neighborhoods were still in shambles. For Aftermath, I photographed three neighborhoods: The ninth ward, an inner city public houses project and a wealthy white suburb. I met with local activists who welcomed me into their homes and asked me to promise not to forget them or their neighborhoods. The week I photographed the Ninth ward, a crew from the NY times was there in full force. I began to question how to create a personal response that wasn’t journalism. The final concept for the work was to create a street party bringing together the various neighbors around glowing light-boxes on an empty street. However, this was not fully realized. In seeking out support to continue the work, I encountered a common refrain in the art world that there were too many images already of post- Katrina and it was time to move on, which is the opposite to the local community response. I have come to see the work I produced in this vein, as a conceptual documentary process, rather than simply as fine art documentary work. This term conceptual document addresses more closely the practice I have evolved over the years, one that engages in larger questions of the meaning of the document itself, as well as directs the viewer’s attention to the complexity of documentary with its legacy of social justice. I want viewers to remain on their toes, to recognize the meaning of the work exists in a space between the fine art and the document, my perception and theirs. Such work asks more questions than provides answers. In several of the conceptual documentary projects, I employ vernacular images in concert with fine prints, text or collage. Topics I have addressed include growing up female, home and homelessness, identity and the vernacular image, the family album, history and memory and a sense of place. From the series On the Edge of Shelter: Homelessness in Chicago by Angela Kelly. Can you tell us more about Sundays at Sea? ‘Sundays at Sea’ is a very personal project. It evolved out a tragedy in my family. In March 1988, my father, Patrick, my mother Mary and my ten year old niece, Sarah died in a fire in my family home. One of the few items saved was my father’s sea trunk. Within 24 hours of the fire, I stood within the shell of the burned out house and took photographs. I put them away and couldn’t bear to develop the film until years later. I began to collage the few family photographs I had into these burned -out rooms creating large oversized bxw mural, which I made in the darkroom. 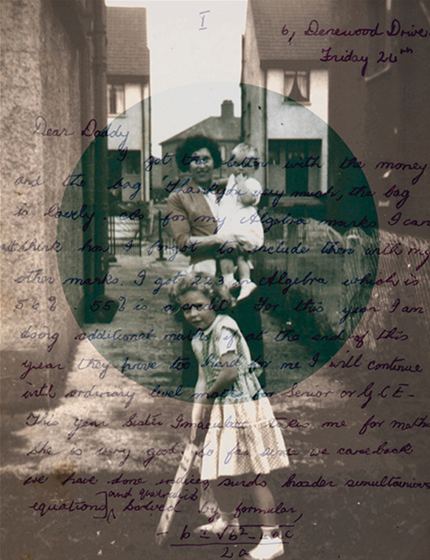 I developed a class, “Beyond the Family Album: the Family Album as Art” in homage to the exhibition, I had worked on with Jo Spence earlier, and in homage to my family. Eight years passed before I felt ready to go ‘home’ again. My brother saved my father’s sea trunk like a sacred relic. I decided to make a body of work using material from the trunk. This included letters I had written to my father at sea, articles of clothing, maps, charts, my father’s notebooks, and family album photographs. The title came from a notebook found in the trunk in which my father made a list of all the Sundays he was on duty at sea, presumably to note his overtime. I grew up in Belfast, N. Ireland where I observed my handsome uniformed father sail in and out of my mother’s domestic life. His appearance provoked a ritual. We rushed to see who would be the first to open his sea trunk. Here the promise of exotic trinkets lay among a travel shaving kit, sewing supplies, a wallet of photographs and the crumpled white naval uniform worn in the tropics. Through out my childhood, my father would mark these occasions by photographing us. By the time he retired, and finally came home, my mother, siblings and I had drifted on to our own lives. By the time I had completed this work, I was also seriously developing research into the family album in a more scholarly sense. 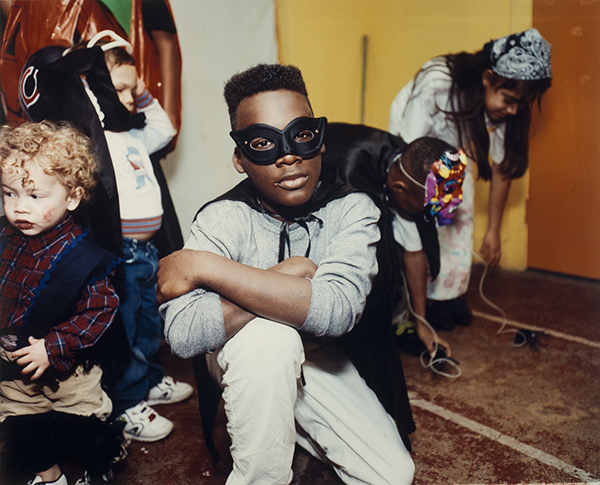 I developed a love of not only vernacular images but also for what artists might do with them. The process of making this work was profoundly influential on future projects though aesthetically I moved back towards examining the notion of a document, this time in concert with my own family photographs but for a different purpose. The merging of maps with the family photos provides a feeling of absence and almost displacement for me. Photographs speaking of absence is such an interesting idea because we often mistake them as a kind of presence. How do you view this dichotomy? This dichotomy was a perfect one to explore within Sundays at Sea and with the work that came after. 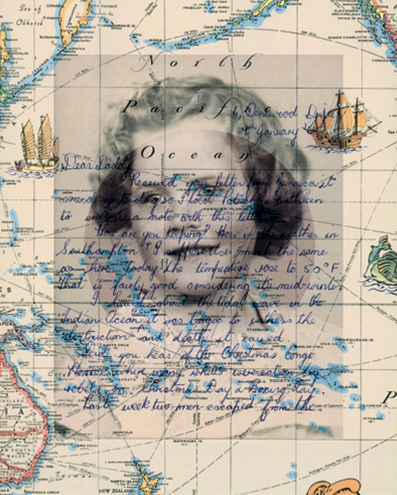 My interest in mapping goes back to my childhood where I poured over maps of the world tracing my father’s journeys at sea. As a merchant naval officer, he was more often ‘ not there’ than ‘there’ His presence was always followed by his absence as inevitably he left for longer and longer journeys. Further, my own pursuit of photography has led me to leave home and to assume a new identity, which I see as ‘neither here nor there.’ I no longer succumb to the daily rituals of life in N. Ireland in all its subtleties and past stresses, as I knew it, and with each passing year it no longer knows me. This suggests to me both a loss of identity and a fear of further erasure of the past. The use of maps and later mapping elements such as the compass rose, lines of longitude or GPS coordinates is both evidential and metaphorical. Mapping elements on the surface reference a certain kind of factual knowledge, but as Tim Robinson suggests in his divine book, Setting Foot on the Shores of Connemara and Other Writings, maps are really works of art and map- making itself a political act. My desire was to intimate what the map doesn’t reveal or purports to show in contrast to the very information a map provides. In ‘Women and Children First,’ (above) the narrative behind the work is only partly accessible and must be decoded through historical knowledge about Irish immigration. 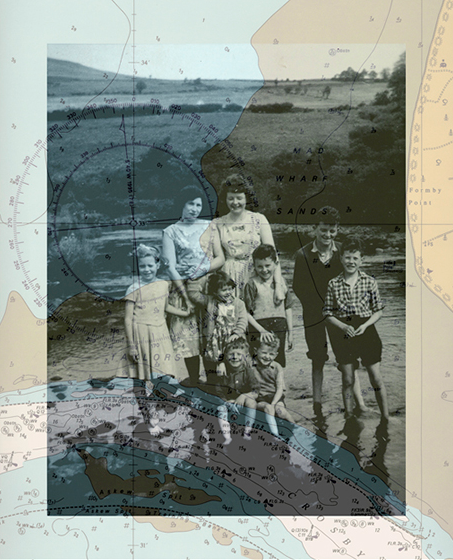 In this piece, I juxtapose a family group photograph over a map of the shallows of the Liverpool estuary of the river Mersey. Liverpool was a common site for Irish immigration in the 19c. In this image, family members stand in a shallow river in Ireland that runs through my great grandfather’s land; the fishing rights of this river having been transferred in the 17c to the landed gentry who occupy the adjacent property. In this photograph, we are all standing both in water and on water; and like the immigrants who came before and after us, acknowledge the fate of those including myself who leave home. In Catharsis what was it like walking around finding locations when this place has many mixed memories for you and so many people? Catharsis grew out my interest in exploring Belfast’s post-conflict sites, which are now tourist sites along the peace walls. This itself is a fascinating phenomenon. I deliberately choose to walk along the Protestant side of the peace walls in a sense to reclaim a space that was not available to me as a Catholic, in the past. Growing up in N. Ireland and living through occupation, curfews and political strife can only be described as traumatic; the residue of which still lingers. 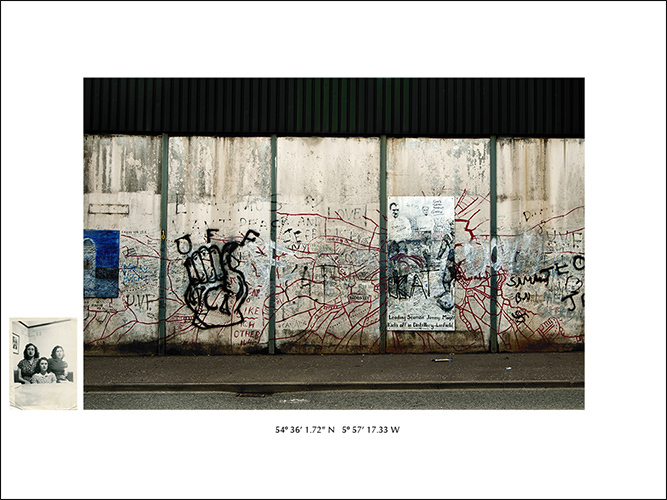 My recent essay, Catharsis: Images of Post-Conflict Belfast for the journal Photographies 2013, addresses how I walked through one particular working class Protestant neighborhood as an insider/outsider adapting the guise of a contemporary flâneur. By adding the GPS coordinates to each photograph,the work also speaks to an absent military presence, a site that is marked by a painful history. Shankill Road Peace Wall with Album Image of my Mother Mary, her sisters Kathleen and Rita in our Belfast living room. What do these places mean to you now? I rarely photographed Belfast in the past; it was just too painful and difficult for me to engage with it. Not only was it a dangerous and difficult negotiation, I didn’t want to fall into the photo journalistic trap of the hit and run photography I associated with Belfast. (We used to make fun of the journalists who came to Belfast to report on it but who strayed no further than the martini bar at the Europa hotel downtown.) When I return now, I am relieved by the positive changes that have taken place. However, I am also very aware of how fragile the peace process really is and how much more is to be done in terms of building trust between the communities. Was it a cathartic experience? What impact did it have on you? As I walked around the Protestant neighborhoods to photograph, I saw the remnants of a brutal legacy but also I felt deeply moved by the Protestant community’s sense of loss, too. This was unexpected. Growing up in the Catholic enclaves of west Belfast, there was a sense that history was on our side and that peace and justice would eventually prevail. While I had the idea to walk along the Protestant side of the peace walls, I didn’t initially intend to juxtapose my family photographs made by my father with these new street photographs. However, the resulting work created a richer more cathartic process, a leap over the void, by filling a gap between small family snapshots and the larger street images, to be read as a metaphor for healing the two communities. 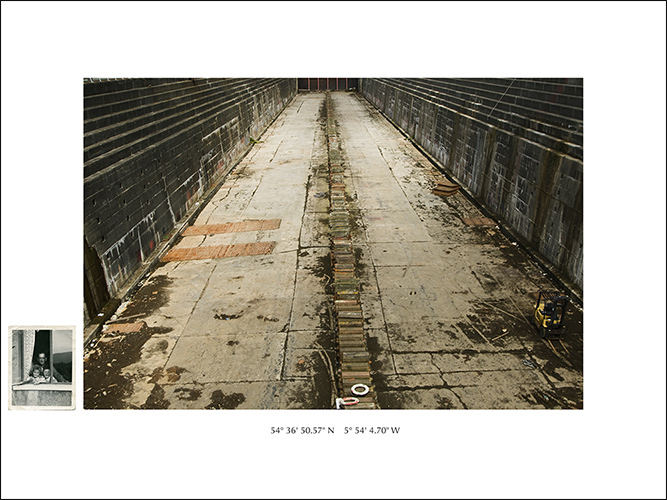 I further expanded my interest in the family album work to reflect on the multiple dualities in the work; the use of scale such as the juxtaposition of tiny intimate snapshots against large- scale seemingly objective street photographs; and the photographing of former conflict sites which are now tourist sites etc. What this points to me as an artist is how the notion of a document cannot be contained but is subject to perpetual scrutiny and shifts of meaning. Thompson Graving Dock, built to house the Titanic with Album Image of Grandfather William John Somerville, Dockworker, and Tony and Angela posing at the window. Throughout the process of making Catharsis, I borrowed the filmic strategies of establishing shot, close-up and medium shot which provided a contrast to the intimate family album images, bringing the work closer to an analytical realm. But what really impacted me the most while traveling through neighborhoods,was how much my own story of return was a universal one. Image and text have been working together for a long time. Roland Barthes warned us against anchoring an image too much by words and the potential that can be released by adopting a ‘relay’ method, where text is used as a way to enhance or complement images, making the text as much an image as the photograph. Can you tell us what excites you most about how image and text complement each other in your work and how you make this happen? I love the idea that images and text, which seem to operate solely within discrete language systems, find a way to slip into each other’s territory. Just as there are multiple ways to use the written word to upend various conventions, so too can images be thought of as another system of representation that need not be solely dependent on a single internal visual logic. Photographs are marked through and through by context, ideology and conventions. I am interested less in using text to illustrate an image, though there are times when this too is appropriate, rather, I enjoy the playfully intellectual challenge of combining text and images to push the meaning of both. I also now think less in terms of the image and text as simply complementing each other, but to go further, I want to know how far I can go to dissolve one into the other, to create a visual/ textual commentary about the nature of language itself. 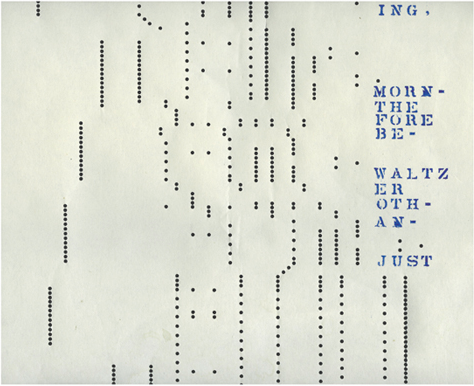 Despite the pre-planning of certain pieces such as the typewriter work, the process of using text and images together has been fairly intuitive. I didn’t initially plan to do an image- text series but the work kept coming. For example I collect ‘words’ related to various subjects of interest, such as ‘the language of war’ which led the piece, Trauma. Here the word, trauma is seen as if in a mirror, like catching the word Ambulance in a rear view mirror. Other pieces are inspired by literary favorites of mine, such as John Keats and Virginia Woolf. The piece comprises a photographic scan of a music scroll for a player piano. The hole-punch card spells out computer-like code that translates it into song lyrics with a sound component. The placement of the text coincides with the code but in order to read the text within the images, you have to re -think how you usually read a picture. To understand the fragmented text, you read this image from bottom to top, against the usual western style of reading from left to right and top to bottom. On reading the text, the viewer discovers the fragment of the song is about a romantic moment as a couple steal one more waltz before the morning light. This homage to Barthes’ Image, Music, Text references three mediums in one. It is a photographic image, a text and a piece of music. It is a sly nod to my desire to play with language whether visual or textual in the same moment. The image-text work brings out my imaginative side and provides a place for me to experiment – to push the boundaries – something I am always eager to do.